Built in 1899 as Kilnsea, by Gray at West Hartlepool, for the Sea Steamship Co., Hull. 2994 gt: LBP 99.1: Beam 14.4m Service speed 9.0kts. 1899 Kilnsea, Sea Steamship Co., Hull. 1910 General Gordon, Gordon Stamship Co. Ltd., Glasgow. 1918 General Gordon, English Sreamship Co. Ltd., Swansea. 1919 Hurliness, English Steamship Co. Ltd, Swansea. 1919 Hurliness, Cornborough Shipping Co. Ltd., Swansea. 1924 Hurliness, St.Just Steamship Co. Ltd., Swansea. 1924 Giyo Maru, Kusaba Senpakubu GK, Darien. 1928 Ashiharu Maru, Azuma Kisen GK, Darien. 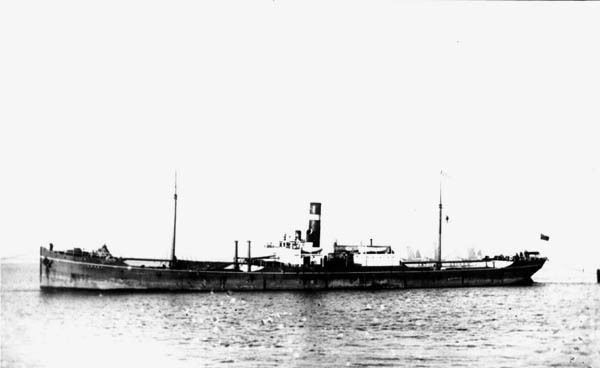 1929 Wrecked off Mofu Point, Hainan Strait, on passage Hong Kong to Hongay in ballast.